Tory Gattis has an interesting suggestion for that 136 acre tract of land east of downtown. 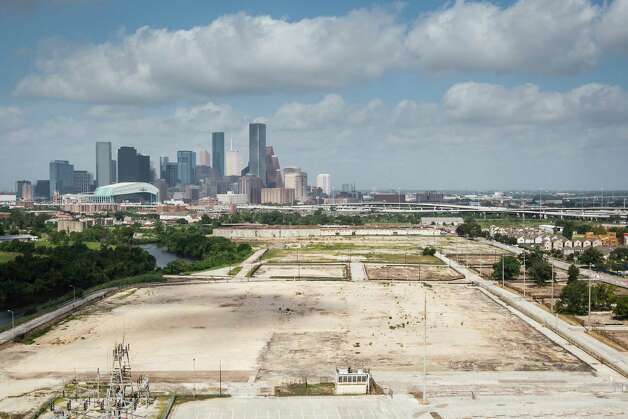 This parcel of land could be the last opportunity for Houston to add a major college campus to the city. We should consider something similar to what NYC just did with Roosevelt Island, where after a long evaluation process they awarded it to Cornell for a technology campus. That is likely to eventually be a huge economic development boon for New York. Of course the City of Houston doesn’t own the land, but it could be a facilitator (along with the GHP) to open discussions with the landowner and various universities to explore interest. There are a lot of potential options. He lays out a number of possibilities, which I encourage you to examine. I have no idea how feasible any of this is, but it’s worth thinking about. Tory’s right that there may not be another opportunity for a university campus to be built inside the city limits. Such a development would also be a good fit for a streetcar extension when and if one gets built. I still lean towards something mixed use, but I could be persuaded otherwise. What do you think? Something urban, mixed-use, and transit-oriented, one hopes. A rare opportunity lies in 136 acres just east of downtown Houston. The Buffalo Bayou-front parcel, a longtime industrial and office complex, went on the market earlier this summer – a move bayou enthusiasts, East End residents and real estate developers had been anticipating for years. Some of them say the expansive property – even larger than the former AstroWorld site off the South Loop – offers a “once-in-a-lifetime opportunity” to create a multiuse development incorporating the cultural influences of downtown, the East End and other surrounding historic neighborhoods. Architect and urban planner Peter Brown envisions a “town center” where a mix of housing types, offices, shops and cultural attractions encircle a central green space. And he is hardly alone in taking note of the nearly mile-long stretch of bayou frontage. That combination of proximity to water, combined with skyline views, ups the ante. “People are drawn to cities that offer urban vitality in a natural setting – New York and its harbor, Chicago and its lakefront, Denver and its mountains, Austin and Lady Bird Lake,” said Guy Hagstette, project manager of Buffalo Bayou Park and ex-director of Discovery Green. I can’t tell exactly where this is, as no street information is given in the story, but give the description, the photo above, and the suggestion made later in the article by Christof Spieler of a streetcar connection to the EaDo/Stadium light rail station, I can sort of guess; I’d say it’s more or less north of that station, looking at the East Line rail map. It’s clear that a development like this, when it happens, will have a transformative effect on the area. Whether that’s good or bad will depend entirely on what ultimately gets built. The Chron solicited a lot of good feedback from a variety of people – former CM Peter Brown had so much to say they wrote a separate article to capture it all – but in the end I don’t know how much effect anything but what the people who buy the land want to do with it will have. We better hope they get it right. Couple things to add. One, don’t underestimate the value of abutting the Buffalo Bayou. It’s a great natural resource, and many of Houston’s best neighborhoods are built around bayous. If my estimate of where this is and my reading of this Houston Bikeways map is correct, there’s already a bike trail along the bayou in place for the future residents, employees, and shoppers of this location. That would be a nice, convenient way to get into downtown without having to pay to park. Similarly, a streetcar connection to the Harrisburg and Southeast light rail lines would be an excellent addition and would make the development much more transit-accessible. A short streetcar line could be put in for a fairly small amount of money – the 3-mile-long line that Fort Worth eventually decided not to install had a price tag of $88 million. A line from this development to the EaDo/Stadium station would be not nearly that long and would probably only require one car. It could be paid for by the city, Metro, and the developer – I can’t think of a better use of a 380 agreement than that. Finally, something I’ve said before but cannot be said too often is that Houston has a lot of empty spaces and underpopulated areas in it that can and really should be pushed for development as residential or mixed-used properties. Many of them can use existing infrastructure, though improvements will need to be made. Many already have access or proximity to transit, which would allow for denser development. There are a lot of places that can be developed that are close in to downtown or other employment hubs like the Medical Center or Greenspoint. The city has advantages that the increasingly far-flung reaches of unincorporated Harris County do not, and it really needs to prioritize making affordable housing available inside its boundaries for people who would prefer to live closer in, and to make it an attractive alternative to those who might not have thought about it otherwise. Population is power, and if the city isn’t growing it’s going to be losing out. There’s plenty going on for the high-end buyer and that’s good, but it’s a small piece of the market. The KBR site is a great opportunity, but it’s far from the only one. The city needs to find ways to get as many of those other opportunities going as it can. I feel like I’ve heard all this before. Opponents of the planned downtown streetcar system said Tuesday that county officials broke a promise with voters when they agreed to use advanced transportation district funds to help fund the project. The group contends that multiple pieces of campaign literature used to promote the ATD tax in 2004 explicitly stated the money would not go toward light rail or toll roads. A streetcar, they said, is light rail by another name. “I think the average person would say this is light rail,” said Jeff Judson, an Olmos Park city councilman, senior fellow with the Heartland Institute and former president of the Texas Public Policy Network, a conservative think tank that played a large role in the defeat of a 2000 tax increase that would have funded a 53-mile light rail system here. A 2004 VIA campaign brochure, labeled “Keep San Antonio in Motion!” explained why voters should approve a ¼-cent sales tax increase to fund creation of the ATD, which would pay for transportation projects for VIA, the city and the Texas Department of Transportation. The actual ballot included no reference to light rail or anything that would preclude the money from being applied to rail. Michael Dennis, a retired lawyer working with the anti-streetcar coalition, said the brochure qualifies as part of a “contract with the voters” doctrine, which includes whatever voters think they are approving even if it wasn’t on the ballot itself. “That is a binding contract that can be enforced,” Dennis said. So an anti-rail group is claiming that a referendum didn’t say what it said but did say what they say it said. Yep, I was right, I have heard this before. That means the next step will be to demand a re-vote, and another re-vote after that if the result is unfavorable. My advice to Nelson Wolff and the folks at VIA is to stock up on the ibuprofin. You’re going to need it. San Antonio City Council has voted to approve funding for a five-year transit expansion plan that includes a streetcar line. The vote all but guarantees construction of the city’s first urban rail project since San Antonio ended its electric streetcar operation in 1933. “I do believe what this plan does is it looks forward,” [Mayor Julian] Castro said. The city, county and VIA now will draft an interlocal agreement to implement the plan. Bexar County has dedicated $55 million for the starter line, VIA will pay $70 million and the city will pursue creation of a special assessment district in the streetcar corridor, requiring property owners to pay into a pool of money to fund the service. If the district isn’t created, the city deal is void. Over five years, the city will contribute $40 million to the plan, which includes money for two downtown transit centers and two park and ride facilities. See here and here for some related stuff. There’s a lot of ambitious plans for transit expansion going on in San Antonio, some of which will depend on federal funding that is not exactly guaranteed. Which is too bad, because this is something a lot of cities should be thinking about, and there may never be a cheaper time to finance such projects. That’s a much larger discussion, of course. In any event, I wish them well in this endeavor. The board of VIA Metropolitan Transit, the transit agency for San Antonio, has unanimously approved a long term roadmap that will bring rail construction to the city. San Antonio is the largest city in the U.S. with a bus-only transit system, according to the plan. The city’s only previous electric streetcar system was discontinued in 1933. The plan, SmartWaySA, was developed over two years and several series of public workshops. It envisions 39 miles of light-rail, 57 miles of bus rapid transit, and thee miles of streetcar by 2035. By then, Bexar County’s population is expected to have surged to more than 2.15 million. VIA will update the plan every five years. Specific elements of the plan include details on the city’s first bus rapid transit line, set to launch late next year or in early 2013, plus plans for additional bus rapid transit lines stretching north and south. The next priority will be construction of an east-west modern streetcar line through downtown connecting VIA’s planned West Side multimodal center and the Robert Thompson Transit Center at the Alamodome on the East Side. It also has recommendations for two light-rail corridors in the region, one stretching north and south, initially joining the airport and downtown, and one east and west, connecting Lackland AFB to Fort Sam Houston. Here’s the SmartWaySA website, and here’s a map of the draft system plan. I wish I could tell what the streets are that are being designated as the rail corridors. I think the purple one that originates at the airport goes along San Pedro, which would make sense, but the location of Trinity to its west on the map says otherwise. The north-south starter rail line, which will begin as a streetcar line, is intended to be on Broadway, which makes sense. VIA has already received a federal grant to do a feasibility study. Where they get the money for all this is the big question. They’ll be applying for more federal grants, including the TIGER III grant, but there will be local money involved as well. I wish them all the best in moving forward on this. I’m glad to see them continue to move forward. VIA Metropolitan Transit has hired a program manager to oversee its high-capacity transit initiative, a move that board and staff members say will help usher in the agency’s plans for an urban rail line, possibly within the next five to seven years. The board voted to hire engineering and architecture firm HNTB Corp. at a special meeting Wednesday. HNTB, a national firm with an office in San Antonio, will work as VIA’s in-house consultants on urban rail. The firm will oversee the entire process, from deciding the type of rail lines — streetcar or light rail, for example — the level of technology that will be adopted and where those rail lines should go. You can see more about their long-range transit plans here. The comprehensive plan is about more than just rail, but that’s where their rail info is. While VIA has the financial capacity to continue the same level and quality of its current bus service, the agency needs more money to become a true multi-modal agency, President and CEO Keith Parker said. Parker was hired to head VIA in 2009 after helping to bring light rail to Charlotte, N.C., as chief executive there. One of HNTB’s key roles will be to ensure VIA has the financial capacity to build a rail system, something the Federal Transit Administration will require before providing matching funds. “As program manager, we will help you find the money,” Keahey said Wednesday in a presentation to the board before its vote. The FTA advises that urban rail projects of this nature, involving federal dollars, can take seven to 10 years to become fully operational, Keahey said. But Parker wants to see urban streetcar here even sooner — possibly by 2015 or 2016. Given that the proposed Republican transportation reauthorization bill represents a 33% cut in funding from current levels, I don’t know how realistic that is. I wish San Antonio well, though I must admit it will chap my hide a bit if they get something done that quickly while we’re still working to fulfill the promises of the 2003 light rail referendum. West Gray may soon get a lot busier. Developers are proposing multi-story apartment complexes on two sites just a short distance apart along the largely retail roadway, which runs from River Oaks to downtown. Both developers are requesting variances from the Planning Commission that would alter the building setbacks for their projects. The first is at the of site of the Tavern on Gray, a sports bar at at the corner of West Gray and Waugh. The second complex is proposed on the site of the old Houston Ballet building on West Gray near Dunlavy. The ballet recently moved downtown. Click over to see the relevant documents. The rendering of the first site, called Hanover West Gray, hilariously depicts wide-open, uncrowded streets at the Waugh and West Gray location. It’s almost as funny as the drawings you see of various suburban-style strip center developments that show happy people walking through tree-lined areas instead of the vast tree-free parking lots that will actually get built. (Like this or this.) Where do the people that do these drawings live, and what color is the sky on their planet? Jokes aside, I’m generally happy to see infill development happening. What needs to go along with it is a rethinking of the streets that serve these areas, to accommodate and encourage walking and transit instead of simply drawing more cars, of which these streets already have plenty. Andrew Burleson proposed one such alternative awhile back – sadly, the accompanying pictures are no longer there – but there are other possibilities if we’re willing to commit to the idea. The problem, as always, is money, and that’s in short supply these days. It won’t get any cheaper to deal with later on, that’s all I know. Dallas would like the FTA to know that they will gladly take any federal streetcar funds that Fort Worth doesn’t want. That’s the message the Regional Transportation Council, with the support of Dallas leaders, is sending to the Federal Transit Administration this month in the wake of Fort Worth’s decision to shelve its streetcar plan. “We’re going to write a letter, and we hope the FTA sees it our way,” said Dallas City Council member Linda Koop, who is also a member of the RTC. Dallas won its own $23 million grant back in February, when [Transportation Secretary Ray] LaHood announced that the government would help build a loop beginning at Union Station and traveling across the Trinity to Oak Cliff, near Methodist Dallas Health Center and back. Dallas leaders, working with the RTC and DART, soon must send the FTA a clear plan for how it would spend the money and where the additional $15.8 million in required local funds will come from. Koop said those funds have been identified and that the $38.8 million project will proceed alongside a more ambitious effort to develop a full network of downtown streetcars. That system will likely connect to the soon-to-be-upgraded M-Line trolleys that run between Uptown and the Arts District, as well as tie into downtown light-rail service. Some of the money earmarked for the starter line to Oak Cliff will pay for planning that can also lay the groundwork for that larger effort, Koop and others said. In all, the larger project could easily cost more than $100 million. The RTC is also soliciting private funds to get this going, which is something that will be worth watching. All I know is that I felt this same way about high-speed rail funds after watching Republican governors in Ohio and Wisconsin turn their noses up at them, but sadly Texas didn’t get a piece of it. I wish Dallas better luck. Fort Worth may have punted on streetcars, but San Antonio is still moving ahead. It’s not a green light, but it is a boost nonetheless for VIA Metropolitan Transit’s plans to build two streetcar lines downtown. The transit agency recently was awarded a $900,000 federal grant for it to determine where the streetcar’s rail lines would be embedded in streets. But perhaps more importantly, the study — which federal officials require before awarding the project any more money — would ascertain if streetcars indeed are feasible for the area. Although VIA is optimistic the analysis will support its goal of establishing the streetcar lines, President and CEO Keith Parker said the study also will look at other transportation modes, such as rapid transit-style buses and light rail. The study could take up to 11/2 years to complete, VIA spokesman Andy Scheidt said. Seems like an awful long time to do a study, but whatever. I look forward to seeing the results. In Salt Lake City, Phoenix, San Diego and other cities large and small, light rail is taking off. The trains look more like streetcars than anything else. They’re only one or two cars long, and are electrically powered. The narrow footprint of light rail cars allows them to be put in dense urban areas, on already crowded streets. Generally speaking, light rail is built with its own right of way, while streetcars are built to share existing road lanes with automobiles. That makes light rail faster and more efficient, but also much more expensive than streetcars. When I was listening to this, it made me wonder if they were really speaking about LRT per se, or about LRT plus streetcars plus commuter rail, all lumped together. They cite Dallas as an example in the story but not Houston, which given that Dallas’ system is much more suburban-commuter oriented and less about taking advantage of density makes me think they’re mixing their apples and oranges a bit. I don’t think it changes the nature of the story, I just thought they should have been a little more careful with their terminology. The current downturn has meant that there have been fewer sales tax revenues, which are paying for the system, and costs have spiraled upward. And in a new era of cutbacks, it’s not clear if more money from the federal government is coming either. That subject came up in my interview with Gilbert Garcia and Christof Spieler. Until the basic funding mechanism is reauthorized by Congress, there’s no new money available. Which is tragic on many levels, especially if you believe as I do that the feds should be picking up a much greater share of the costs than they do now. Until we change our default assumptions that make funding highways so much easier, and with so much more money to be had, that’s how it’s going to be. The city’s discussion and study of the viability of a modern streetcar system for the central city is over for now. The City Council voted 5-3 [last] Tuesday to pull the plug on a feasibility study of running a streetcar line to the near north side through downtown and the near south side. A vote to proceed with the study would have paved the way for the city to accept a $25 million federal grant, which was expected to jump-start the estimated $88 million project. A consultant, HDR Engineering, reported that streetcars were viable for the center city. The line, according to city plans, would have consisted of three cars traversing a six-mile round-trip. It would have operated 14 hours a day, 365 days a year and carry an estimated 2,000 people a day. The total cost of construction would have been offset by the federal grant. The rest would have been covered by the Trinity River Vision and Southside tax increment financing districts, or TIFs. Officials estimated the system’s operating cost at $1.6 million a year, which initially would be funded by the Fort Worth Transportation Authority, or the T.
Later, residents of the neighborhoods where the line runs would vote on whether to take on operational costs. I’ve blogged about this a few times – as with all transit-related projects, it’s been going on for awhile. The naysayers were concerned that costs were too high and the benefits were overstated. I don’t know enough about Fort Worth to evaluate this particular project, but I’m disappointed this is being shelved anyway. I hope they reconsider some day, and that they will still have an opportunity to get federal funds when they do. Speaking from our experience here, that should never be taken for granted. Thanks to Houston Tomorrow for the link. Good for them, though they’re not quite ready to jump on it yet. A downtown streetcar loop could be in Fort Worth’s near future, but the City Council has some serious issues to consider first. Transportation Secretary Ray LaHood announced Thursday that an “urban circulator” project submitted by the city and Fort Worth Transit Authority was selected for almost $25 million in federal funding. But Councilman Jungus Jordan said a feasibility study on the project won’t be finished until September or October, and the council has other projects with higher priority than the 2.5-mile streetcar loop. The project’s selection for part of $293 million in federal funding means that the city must now apply to the Urban Circulator Grant Program, said Paul Griffo, a Transportation Department spokesman. Jordan said that application can’t be made until after Council discussions that won’t begin until November, and could take weeks. I presume the money will still be there when they get around to making the application. Some background on their plans can be found here and here. A full list of what got approved by the FTA is here; Dallas and Brownsville are on the list, though their projects are much smaller than Fort Worth’s, at least in terms of the size of the grant. A statement from State Sen. Wendy Davis, who was previously a Fort Worth City Council member, is here. I wish them well in getting this completed. As we know, San Antonio is seeking federal funds to build a streetcar line emanating from downtown. That’s not their only big transit plan in the works. As the On the Move blog reports, VIA has proposed changing one of their busiest bus routes into a bus rapid transit line. They have some public meetings this week to solicit feedback on it. Click over for more details, including links to the relevant draft environmental impact statements. They may be scaling back in Dallas, but San Antonio’s transit agency will apply for more federal funds to build a more extensive streetcar network. VIA Metropolitan Transit’s board of trustees voted Tuesday to spike a federal grant application for up to $25 million because it could have ended up costing the agency and its partners — the city and Bexar County — more money to build a streetcar system in the long run. Instead, the board directed VIA staff to seek federal funding through the Federal Transit Administration’s New Starts and Small Starts program, which allows for larger amounts of federal funding. Using the Small Starts program, VIA would move away from its controversial decision to build only a north-south streetcar route along Broadway and South Alamo as its first-phase project. With Small Starts funding, VIA would be able to build both north-south and east-west routes in its first phase of construction. “The true upside of the Small Starts process is that we’d be able, with the same amount of local money, to do both projects,” said Keith Parker, VIA’s president and CEO. Both lines are primarily downtown, though future expansion will venture a bit farther out. If they succeed at this, it could all be up and running by 2016, which at this point might be sooner than the University line here. Given all the ups and downs with the FTA funding process that Metro has experienced, all I can say is good luck with the paperwork. The TCU Daily Skiff writes about Fort Worth’s plans for streetcars. The city of Fort Worth plans to move forward with bringing in a nationally recognized consultant to finalize aspects of a modern streetcar system that would consist of an initial loop through downtown Fort Worth as early as 2014 and possibly connecting to campus in the future, a city official said. David Gaspers, a senior planner in the city’s planning and development department, said plans for the modern streetcars began in 2008 when Mayor Mike Moncrief and the city council appointed an initial study committee to look at the feasibility of a streetcar system for central Fort Worth. The committee found the streetcar system to be a feasible option and recommended an initial route spanning from downtown, Gaspers said. Even though the initial route would connect nearest to campus at the Cultural District, Gaspers said he did not see why the streetcar line would not connect to the campus in the future. Historically, streetcars connected downtown Fort Worth to campus during the 1920s, he said. That’s the same basic idea as what they’re doing in San Antonio. I don’t know the geography of Fort Worth, but if their plan is anything like SA’s, then the area in question is likely still pretty walkable, and thus at least reasonably well-suited for this kind of transit. I wish them luck in getting it done. Via Houston Tomorrow. Another step forward for San Antonio’s quest to lose its title as the most populous city in America without rail transit. VIA Metropolitan Transit’s trustees on Tuesday approved the routes for a streetcar system and directed agency staff to seek a $25 million grant to help fund an initial segment. 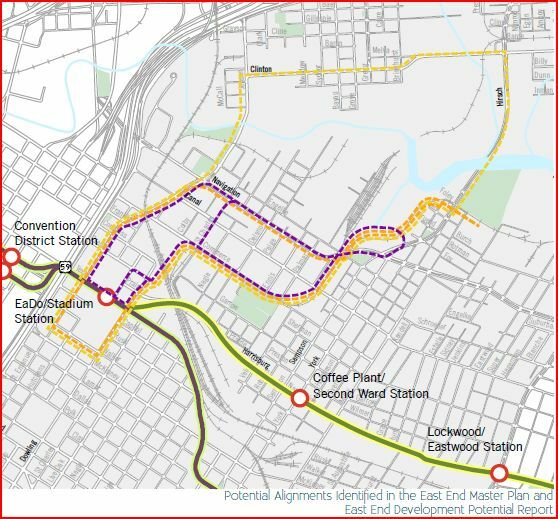 VIA plans to submit an application to the Federal Transit Administration by Feb. 8 seeking the funding for a 2.2-mile, north-south route that largely would run along Broadway and South Alamo Street, from Josephine Street to South St. Mary’s Street. Officials currently expect that segment to cost roughly $90 million. The board also approved an east-west route that ultimately could connect the AT&T Center to Our Lady of the Lake University, traversing downtown along East Nueva. Mayor Julián Castro and County Judge Nelson Wolff told the VIA board that the city and county are ready to be full partners in the development of the system and committed to help bridge a funding gap. The grant would require at least 20 percent in local matching funds. Previous blogging here and here; my thanks to commenter UrbanInfill in the latter post for pointing this out to me. It’s worth noting that a logical future extension of any San Antonio light rail system – these lines are currently envisioned as streetcars, with the plan that they would be converted if ridership supported it – would be to the airport, which is not too far north of downtown at US281 and Loop 410. But a Broadway route isn’t really suitable for that, so some other option would be needed. A commenter on the news story suggested San Pedro as an alternative to Broadway; if nothing else, I think you could make an airport connection work from such a line. Just a thought. Also, it’s nice to see city and county governments working together on a project like this as Castro and Wolff appear to be doing. I wonder what their secret is. Streetcars may be coming to a street near you in many cities. What links Boise, Cincinnati and Charlotte — and Salt Lake City, Dallas, Atlanta and Kansas City, where streetcar tracks abandoned in 1953 still poke through the city’s weathered asphalt — is they’re among dozens of local governments hoping their modern street projects will benefit from federal grants, including $1.5 billion in stimulus funding due to be awarded by mid-February 2010. In all, some 80 U.S. cities have streetcar proposals, the American Public Transportation Association says, a trend bolstered by President Barack Obama’s signal he’s more inclined to pump federal dollars into streetcars than was President Bush. Foes, however, dismiss trolleys as “toy trains” that benefit special interests and promote profligate public spending. The rush for easy federal cash, they argue, is obscuring the reality that cities will eventually rely on taxpayers to subsidize lines; federal dollars go only for construction. Yeah, well, foes of light rail here in Houston often called the Main Street line a “toy train”. It wasn’t a cogent criticism then, and it isn’t one now. To most of these guys, any spending, at least on stuff they don’t approve of, qualifies as “profligate”. My gas tax dollars help to subsidize plenty of highways that I never drive on. Either these things provide a useful service that’s worth paying for or they don’t. That’s how they should be judged, not whether or not public funding should be used on them. Do what makes sense. San Antonio is looking to Portland for inspiration as it contemplates a streetcar system. In the 1990s, driven by a plan to infuse the inner city with new residents, transit advocates drew up plans to link several districts by streetcar and encourage dense, walkable, mixed-use development designed around the rail line. As it turns out, the little streetcar line — four miles from end to end — is an economic powerhouse, according to Portland officials. They say some $3.5 billion has been invested within two blocks of the streetcar line’s footprint. More than 10,000 new housing units and 5.4 million square feet of office space have been built in the same area. San Antonio officials are looking to replicate that. Henry Muñoz, VIA Metropolitan Transit’s board chairman, said he expects the agency to break ground in two or three years and will announce in the next month a citizens advisory committee to help guide the creation of a starter streetcar system. “It’s something that could have potentially enormous impact on the city center of San Antonio,” he said. While the idea of streetcars in San Antonio is in its infancy, Muñoz envisions lines running both north-south and east-west, connecting some of the city’s great cultural centers, sports facilities and public institutions. From Mission San José, a line could run north, to the southern border of Alamo Heights. And a perpendicular line could run from the AT&T Center on the East Side to Our Lady of the Lake University on the West Side. Muñoz said he’s uncertain how much could be built initially because of the expense. During conversations in Portland, San Antonio leaders rattled off a number of key sites that potentially could be accessed by a streetcar system: Southtown, HemisFair Park, the Convention Center, the River Walk, the Alamo, Municipal Auditorium, Market Square, Museo Alameda del Smithsonian, several college campuses, the Witte Museum, the San Antonio Museum of Art, the Alamodome and even Fort Sam Houston. Any site accessible by streetcar would stand to benefit from the line, including the Museo Alameda, for which Muñoz was a driving force, and the Pearl Brewery, whose owner had representatives on the Portland trip. In a joint effort between VIA and the Downtown Alliance, the Inner-City Rail Circulator Study is under way as well. The feasibility study, due to be released this fall, will help determine whether San Antonio can support a system, how much it would cost and where it would be aligned. But it’s clear that local officials aren’t waiting for the results to move forward on planning. There used to be a streetcar system in the early part of last century that ran up Broadway to Alamo Heights, past where Brackenridge Park now is. In addition to being historically true, it just makes sense. I hope they dare to think big about this. Which means thinking about more than just streetcars. It’s clear there’s been a shift in thinking among local leaders, who in the past have advocated for light rail. They say a streetcar system, which is smaller in scale and cost, could prove to be a gateway to larger projects for San Antonio. A starter system would allow people to “kick the tires” and get used to rail, which could lead to support for larger light rail and commuter lines that move more people longer distances. For now, San Antonio will remain the largest city in the country without rail. The notion makes Muñoz cringe, but he sees San Antonio at a crossroads. Taking this approach, and focusing on the area in and around downtown seems like a good idea for starters, though if the hope is to eventually incorporate light rail, I hope they leave themselves room for dedicated right of way. Part of the problem now, as the story notes, is that San Antonio isn’t very dense, and it has been resistant to density, though new Mayor Julian Castro is a fan. Maybe they can use this process to help them do mixed-use and transit-oriented development in a way that Houston still hasn’t quite figured out. I wish them luck in getting it done. On a related note, I see that Dallas may be catching streetcar fever as well. Dallas of course already has a successful rail system in place, so this would be an extension of that. They may have an easier time getting it off the ground as a result. Will the Alabama Bookstop be spared the wrecking ball? A commenter at Swamplot, who claims to have inside information, has the following to say about the River Oaks Shopping Center and the Alabama Bookstop. 1. Barnes and Noble owns Bookstop. They are closing it to move to the new location at ROSC. 2. Weingarten has no intent of demolishing the Alabama Theater. They have been marketing the space for re-use. They intend to restore the facade when a new tenant signs on. Everyone knew that the Bookstop’s days were numbered. With the massive Borders Books just a few blocks away at Alabama and Kirby, and the new B&N opening soon, there couldn’t possibly be enough capacity to keep the Bookstop in business as well. The question that vexed everyone who cared about preservation was what would happen to the historic Alabama Theater building that currently houses the Bookstop. If this information is accurate, it’s the first positive thing I’ve heard about its disposition since Weingarten first announced the demolition of the original River Oaks Shopping Center. The commenter had more to say about other matters, including this somewhat puzzling bit. 4. Weingarten’s long term interest in ROSC is to achieve the highest and best use for this property. They want to bring a higher density to the center that they feel is appropriate for its location. 5. Before the crash last fall they were working on a plan to improve the walk-a-bility of the ROSC through landscaping and art. I believe the project is on hold right now. Its interesting how everyone is in favor of density (less driving and more walking) except when it affects something in your backyard. I still don’t understand how adding a massive bookstore and a five-story parking garage contributes to “less driving and more walking”. There’s a discussion in the comments to that Swamplot post about how of course the ROSC is “walkable” because hey, you can park your car in the lot and then walk to any of the nearby stores. By that definition, the shopping center that includes the Costco at I-10 and Bunker Hill is walkable, too. The new ROSC may or may not be more pedestrian-friendly than the old one was, at least for those who drove and parked there. There are certainly things that can be done to make it so, some of which were explored in that comment thread – planting trees, widening sidewalks, etc. I seriously doubt Weingarten cares to spend any of its own money on stuff like that, but I’ll be happy to be proven wrong about that. When there’s mixed-use development in this area, as well as transit options to get residents in and out of there without needing to drive, then we can talk about density and walkability in a meaningful fashion. Here’s a little discussion starter for all you transit geeks: Infrastructurist’s list of 36 reasons why streetcars are better than buses. I’d boil a lot of it down to a smaller list: The ride is generally more pleasant, as it is smoother, quieter, and lacks any diesel exhaust smell, they’re more cost-effective in the long run, they can use green energy sources right now, and people tend to like them and use them more. Having said all that, M1EK‘s point about the difference between rail with dedicated right of way and rail that shares right of way with other traffic is still valid and needs to be addressed with any streetcar proposal. I think in Houston there are some corridors that could benefit today from streetcars, including a few that intersect or may someday intersect with a light rail line. Christof and Andrew have already tilled that field (I contributed as well), so go review what they had to say. With Austin and Fort Worth, we may be able to learn from other Texas cities’ experience soon. What do you think? Some good comments and followup to my earlier post about traffic in the inner core. I want to address Cory’s questions regarding BRT. The short answer is that I have no particular objection to BRT – it’s a perfectly fine technology, and cheaper to implement than light rail. It has a place in the mix, especially in places where the cost of LRT would make it infeasible given ridership projections. As long as it has its own right of way, it’s acceptable and may be optimal. Having said that, I do think light rail is superior, and I agree with Andrew that LRT has much greater potential to attract genuine transit-oriented development. And let’s not forget that the 2003 Metro referendum was about light rail – the furor that erupted when Metro scaled back from LRT to BRT was because people thought they;d been baited and switched. We can certainly talk about BRT going forward – indeed, if the discussion is primarily about BRT versus LRT, as opposed to the usual more roads versus even more roads, I’ll be thrilled – but for now I’m more interested in light rail. Well, I’m also interested in the streetcar discussion that Christof started. Andrew has taken his original concept for a West Gray streetcar line and fleshed it out some more. It’s a really intriguing concept, and I hope it leads to some more good ideas. Take a look and see what you think. In my experience, however, once you’re actually walking, people quickly get tired of it if you’re walking on broken old sidewalks or no sidewalks at all. They’ll almost immediately ask “are you sure we shouldn’t just drive?” But on nice sidewalks, especially when there’s retail opening on to the street and other people out walking, most people will go longer distances without noticing. That’s something that I’ve thought about a lot as I’ve tried to imagine rail lines along Washington and Kirby, as I’ve proposed them. Washington is a street that should be far more walkable than it is, and I know that it’s in line for a big overhaul in the nearish future, but for now it’s got narrow sidewalks that abut the street, with no grass or anything as a buffer, with utility poles and other obstacles for walkers to dodge. Fixing that, hopefully in conjunction with planning for a rail line, will go a long way towards improving that whole area. (Fixing Studemont as well would go even further.) Kirby is reasonably walkable in most places, and it’s already undergoing a facelift north of 59, but for the rail line I’ve proposed something would have to be done to it between Bissonnet and Richmond, and to Yale Street on the north end of the line. I don’t know what can be done about this now other than talk about it and hope to get other people talking about it, so consider this a contribution towards that end. What parts of town should have better sidewalks than they currently do? Leave a comment and let me know.